Accounting major Natalie Garduno helps Concepcion Rivera with her income tax preparation. Members of the Pomona community can get free assistance in filing their taxes beginning on Tax Day, which is Feb. 9. 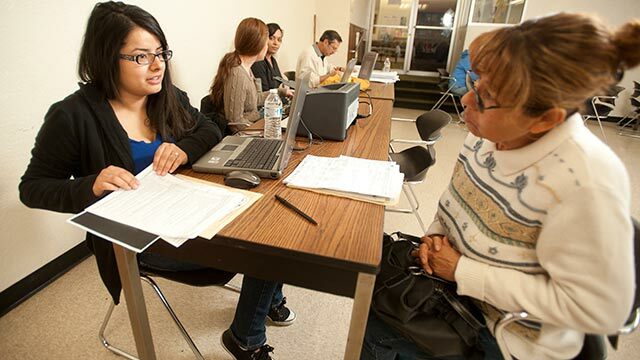 Tax Day inaugurates the start of Cal Poly Pomona’s Volunteer Income Tax Assistance (VITA), an IRS-backed program for most individuals or households making less than $54,000. Upper-division accounting students from the College of Business Administration prepare returns under the supervision of industry professionals. In addition, the IRS-certified students will offer several cost-free tax assistance clinics for community at different locations over the next few months. Locations include the Boys & Girls Club of Pomona Valley, Pomona Public Library, West Covina Library and Azusa Public Library. This year’s aspiring accountants completed a series of IRS courses and training on the latest tax laws under the watchful eye of accounting faculty. The program offers free basic income tax return preparation with electronic filing to qualified individuals. The VITA program is supported in part by the California Department of Community Services and Development, which provided $344,250 to the CSU5, a conglomerate of the five CSU campuses in Los Angeles County. Cal Poly Pomona’s $41,965 share of the award will support the clinics on campus and in the community, as well as VITA’s long-term program sustainability. No appointment is necessary for Tax Day at Cal Poly Pomona on Feb. 9. Doors open to the public at 10 a.m., and walk-ins will be accommodated until 4 p.m.
Three other locations are open select Saturdays from February through April. Visit the VITA website for hours and locations. You can also eThanks. mail vita@cpp.edu or call 909-869-2365 for details. Chris is a public affairs officer for the College of Business Administration and an alumnus (Comm., ’03) of Cal Poly Pomona. He oversees all college communication efforts and is the editor of Ovation, the CBA’s official magazine.